Apr 4th, 2019: This week ArrrCee and dumptruck escape to another universe! The Quake 2 universe that is. Donde takes us on a decades-long journey through the worldwide Quake 2 multiplayer scene. He documents the historical, sometimes hysterical and always human stories starring gamers from around the world. 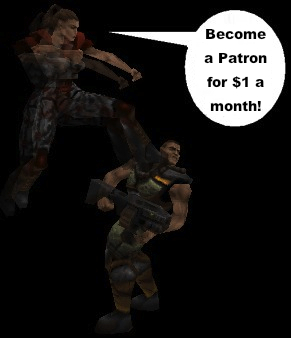 It’s late 90’s gaming history, one Quake 2 story at a time. Dondeq2.com is his ongoing project to document these fascinating stories through articles and in-depth documentary videos. Another weird, wonderful and sometimes deeply poignant edition of the QuakeCast.